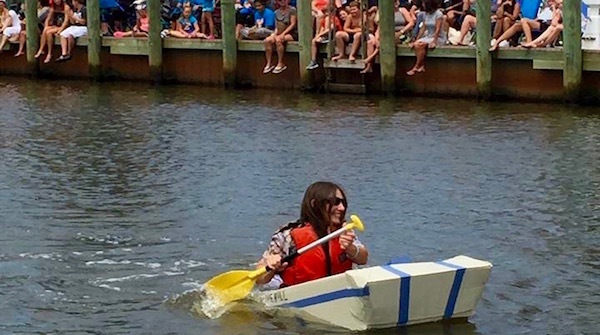 I was a little nervous when I arrived at Riverhead’s downtown waterfront Aug. 6 to enter my tiny water heater-box vessel in Riverhead’s seventh-ever Cardboard Boat Race. My primary fears were all the kind of fears that set me back as a child — fear of being disqualified, fear of having read the rules wrong, fear of being laughed at, fear of standing out. But when Darth Vader walked past me as I carried old Bluebill to the riverfront, followed by Princess Leia and a ninja woman and a whole crew dressed as Holstein cattle, my nerves calmed down. If anything, I didn’t stand out enough. When the pre-entry inspection consisted essentially of a judge squeezing the sides of my boat to ensure they were in fact cardboard and numbering it with a square of duct tape, I realized this contest was bound to be more fun than anything else. The Beacon’s creative director, who accompanied me to ensure I wouldn’t die, said later that I was grinning ear to ear for the rest of the day. It’s the first time he’s ever seen that happen. My preparations for the race hinged heavily on internet research on construction materials — appliance boxes, latex paint, wood glue and duct tape. It turns out, as I suspected, that the paint and glue were far more important waterproofing than the duct tape. But I didn’t follow the Cardboard Boat Race Prime Directive: Have Fun and Be Creative! The last week before the contest was absorbed entirely in finding a name for my boat. It turns out that crowd-sourcing is not the best method for naming a boat, as the U.K. researchers who issued the call that ended up with a vessel named Boaty McBoatface can attest. After receiving a bevy of suggestions, none of which hit me in the heart, I was half-ready to name my boat Boaty McBoatface just to spite convention. Then it came to me, in a dream of my grandfather, who spent the last 20 years of his life dazedly recalling his best years, when he and my deceased grandmother repeatedly crossed the gulf stream on a little Elco named Bluebill en route to Cat Island in the Bahamas, where they’d been contracted to build a house. If the boat wasn’t going to be named Bluebill, it may as well not have been named anything, and not having a name was definitely against the rules. Mom won the race. Old Bluebill nearly swamped when I let in with the first overly ambitious stroke of my paddle, sinking her hindquarters and her ship’s colors into the muddy Peconic. The crowd thought I was a goner. I focused my eyes on the turnaround mark and paddled slowly, one stroke on each side, as the rescue crew followed me warily, waiting for the seemingly inevitable sinking. By the time I rounded the mark, Mom had already won the race, and all I could do was stare at a point about 20 feet ahead of me and paddle. But something crazy happened at just this moment. The crowd began cheering old Bluebill’s name. I didn’t know it, but photos I’ve seen since prove the point — Bluebill was half-sunk but somehow still moving forward with every paddle. Grandpa was with me, and he didn’t let me down. Back at the dock, Councilman Jim Wooten and some super-friendly Cardboard Boat Race judges fished me out of Bluebill and then fished old Bluebill out of the river. We’d won the third place trophy, albeit by default due to low participation. We’ve got this, Grandpa! From Riverhead to Micronesia and Beyond! Long live cardboard. See you next year, Riverhead. Behind on my reading, I just learned about the boat’s construction in your print edition, so naturally I was wondering what happened. So glad for the follow up, that you didn’t drown, and for the tribute to Hal. But what a shame about the low participation!